The Yang Lab welcomes highly motivated applicants from a variety of scientific backgrounds, including physics, math, biology, chemistry, engineering and computer sicence. As a multidisciplinary group, we expect applicants to communicate well with people from different backgrounds, and to combine physical concepts, mathematical modeling, and quantitative experiments to understand biological phenomena. If you want to explore more, please contact us. Please email me qiongy@umich.edu with your CV, a brief description of your research interstests and future plans, and the names of three references. Below is a flyer for the position. 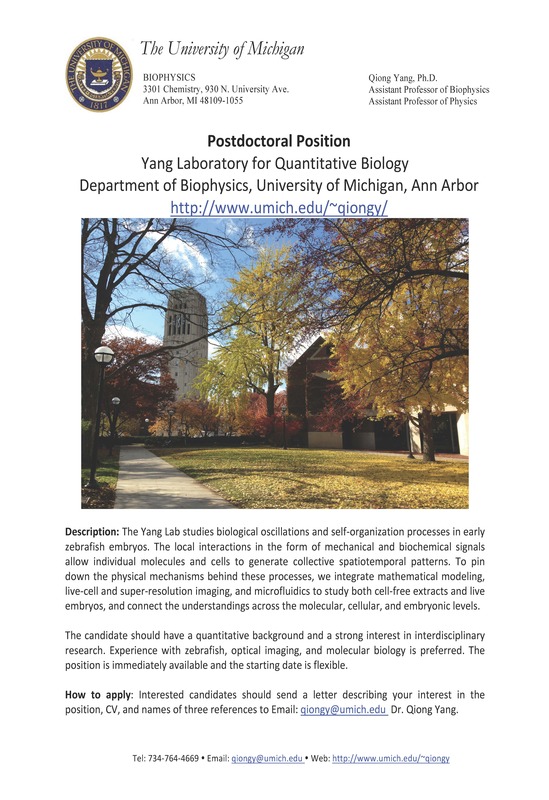 If you are a current graduate student and intersted in a rotation in our lab or joining us, please email me qiongy@umich.edu with your CV. We will arrange a meeting to talk about the research in our lab. If you are a prospetive graduate student, please apply through the Department of Biophysics or through the Program in Biomedical Science (PIBS). If you have a particular interest in our lab's research, please feel free to email me qiongy@umich.edu. The Yang Lab offers many opportunities for motivated undergraduate students who want to get involved in research. We encourage undergraduates to take the lead on their own projects which will lead to publications, so we prefer students to start working in our lab early and continue to work throughout the rest of your undergraduate career. If you are interested, please email me qiongy@umich.edu to indicate your interests and plans. We will arrange a meeting to talk about the research in our lab.